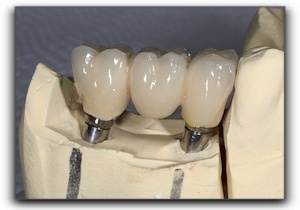 Today’s post looks at the complex process required to create a dental crown. Dental crowns can be constructed with metal, ceramic (porcelain), plastics, or varying combinations of these. We will describe the process used to create a porcelain crown, though the steps are similar to those used for other materials. Modern porcelain crowns are a technological and artistic marvel that make successful reconstructive and cosmetic dentistry possible. This picture shows three crowns attached to two implant posts. While the most advanced sdental lab techs and proficient ceramists can’t make a tooth as strong as Mother Nature can, they are getting pretty darn close. When one of our The Parkway Dentist patients needs a crown, a dental assistant makes an impression of all the teeth. The impression is sent to a laboratory where the plaster teeth are separated. The individual tooth mold in need of restoration is scanned into a computer to have the specific dimensions to send to the factory. The state-of-the-art factory has a computerized machine that will then pour plaster into cylindrical molds, forming blanks. Once hardened, the process of making the tooth from the plaster blanks begins. The machine then takes the scanned data from the impression and begins sculpting out the contours found in the scan. The finished tooth is not to scale, being 20% to 30% larger than necessary. This enlargement is to allow for material shrinkage that will later occur. The machine then dips the plastered tooth into liquid ceramic. The ceramic hardens and gives the tooth a gleaming, natural finish that is indistinguishable from a genuine tooth. The machine then starts a new process of orienting the tooth with others. This time, ceramic powder is poured into new molds over the plaster tooth. The molds are put on a rod and then plunged into a water-filled chamber. Once the chamber lid is closed, water pressure increases, solidifying each ceramic tooth. The crown is then fired to making the porcelain more solid throughout. More hand contouring follows, as needed, and then is finished with a clear, ceramic gloss. All of this work results in a wonderful crown for one of our patients! If you have a broken tooth or old, unattractive crown, or want specifics about smile transformations, call 817-735-1616 to discuss the possibilities.